Although my four-year vacation has ended and I’m now a civilized working stiff, I’m still always looking for ways to break up the monotony and to keep life interesting. I realized I had a three-day weekend coming up (thank you MLK! ), and decided I had to go somewhere. ANYwhere. So I booked a flight to Denver. First and foremost, I’ve never been there. Having never been somewhere is all the reason I need to go there. Second, it’s close enough to Seattle that I wouldn’t have to spend too much time in transit and could maximize ground time for my three-day weekend. Third, flights from Sea-Tac were cheap – roundtrip tickets with Frontier Air cost $114 when I first checked. Because I procrastinated, I ended up paying $178. Not bad. 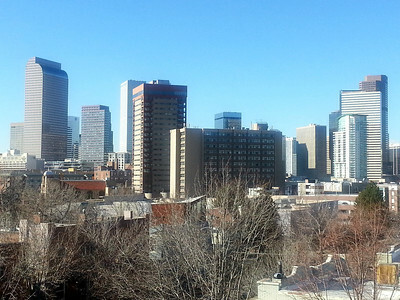 As far back as 2006, when I was living in LA, I’d heard Denver was a trendy, up-and-coming city. Someone once even described it to me as a mini-LA. It boasts a pretty impressive culinary scene (which is always a huge draw for me) and there are plenty of outdoor activities. It’s also apparently great for entrepreneurs – I know two people who just in the last year left LA to move to Denver for business and seem to be doing well. Coincidence or not, both of those businesses are in the beverage industry. Several years ago, another friend of mine picked up on the frozen yogurt trend in LA and brought it to Denver. It’s like a delayed-trend mini-LA. As you know, I’m not much of a planner. I like to show up places, surf couches, take public transportation, and see what happens. However, when my friend Sarah said she wanted to join me (and I’m SO glad she did! ), I knew I’d have to modify my travel style a bit. Sarah is significantly more civilized than I am, and I didn’t wanna freak her out with my scrappy backpacker ways. Instead of couchsurfing, we rented a place on Airbnb (detailed below). Instead of public transportation, we rented a car. That was pretty much the extent of our planning. We’d done some cursory research online but never did decide what we were gonna do. The only thing we actually planned on was to have a damn good time. And that, we did. A couple years ago, Sarah and I had spent a weekend wine-tasting in Eastern Washington. I had found a great place to Couchsurf, and everything was all set. However, I sensed Sarah wasn’t 100% comfortable with the idea of staying in a complete stranger’s home, which is totally fair. So we ended up staying at a hotel. What we both failed to consider was that all the wineries closed around 5 or 6pm, and there was nothing to do in this hobunk town. So we ended up sitting in our hotel room all night, eating chocolate chip cookies. Bummer! Had we Couchsurf’d, however, I know from experience that we would’ve been hanging out with a local, making new friends, or at the very least, gotten some recommendations from a local on what to do or where to go. That, and we would’ve had the comforts of a home, rather than the isolating box of a stale hotel room. Enter Airbnb. It’s the perfect compromise. It’s basically Couchsurfing for profit. Say you have a house with an extra bedroom that you never use. Why not rent it out to people traveling through your town and make some money? And as a traveler who rents the place, you get the comforts of staying in a home, as well as the comfort of knowing you’ve made a legit business transaction to stay there. There’s nothing creepy or weird about it (same goes for Couchsurfing, for the record! Although I do understand why people perceive it otherwise). 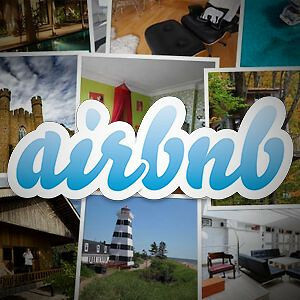 I had never officially rented from Airbnb before, but had experienced it last year with my buddy Jared when we went on a wine-tasting trip to Paso Robles, CA. I super enjoyed the experience and it really stuck with me. I’m pleased to say my first official Airbnb experience was also a resounding success. 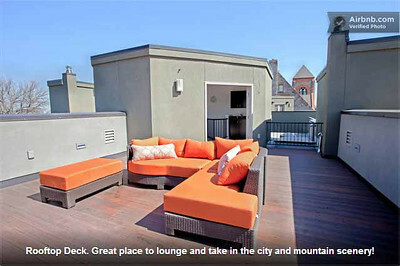 Jon lives in a gorgeous modern townhome in Denver’s historic Five Points neighborhood, just north of Uptown. Sarah and I stayed in a bedroom on the third floor, right next to the spiral staircase that leads to this awesome rooftop terrace. Um, can we say PERFECT? The bed was super comfy, toiletries and hair appliances were provided, and we were encouraged to make ourselves comfortable in the kitchen, living room, etc. Street parking was easy and the neighborhood has a lot of interesting architecture and character – also just a few blocks walk to Uptown’s restaurant row. All for cheaper than a hotel room. We didn’t see much of our host Jon unfortunately – he seemed super nice and we would’ve loved to hang out with him – but nevertheless he made us feel right at home. If you ever go to Denver, I highly HIGHLY recommend you rent from Jon. Click here for more info and photos of his place. Denver’s got a great food scene. From the lobster roll at Steubens to the duck confit at Bistro Vendome to the scallop crudo at Jax Fish House & Oyster Bar, Sarah and I indulged in some fantastic eats. My favorite meal was probably brunch at Snooze. The décor, the food, the service – it was an all-around quality experience. 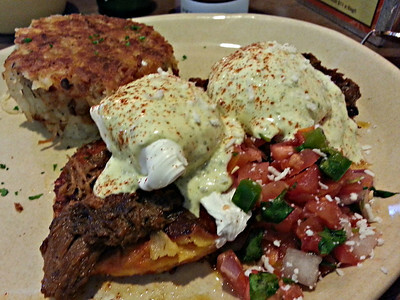 The Chilaquiles Benedict was outSTANDING…a Mexican spin on eggs benedict with juicy barbacoa served on a saucy stack of tortillas, topped with perfectly poached Niman Ranch eggs and smoked cheddar hollandaise sauce and fresh tomato salsa. Mmmm, sohhhh good. The Breakfast Potpie was also a winner with its rich, rosemary sausage gravy and eggs on flaky puff pastry. And the hashbrowns here are delish. If this wasn’t all so filling, we would’ve totally ordered the Pineapple Upside Down Pancakes! 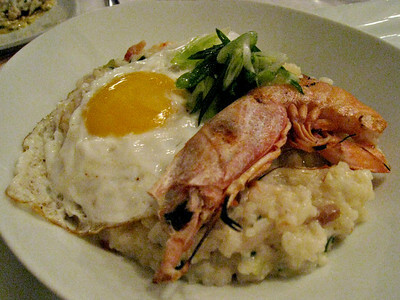 Other honorable mentions: The Bacon-Infused Bloody Mary at Steubens; the Fried Pickles at Freshcraft; the Crab Cake and Carolina Gold Rice Grits (which Sarah and I decided was essentially a risotto, and a great one, at that!) at Jax; the Cherry Creeker Benedict at Syrup; the wine selection at Cru; cocktails at the Cruise Room in the Oxford Hotel. We certainly ate and drank well, but as usual, I wish we could’ve eaten more! Places I wanna try next time: Le Central, The Kitchen, Squeaky Bean, Jelly, and Restaurant Kevin Taylor. Theoretically this would fall under the “Eat, drink and be merry” category but Casa Bonita is such a spectacle of a restaurant, it deserves its own section. This place is obnoxious, hilarious, weird and entertaining on so many levels. I didn’t know whether to laugh or cry at this place, but I did feel a strange sense of unease and mild insanity within myself here (seriously). It’s a trip. Casa Bonita calls itself the largest and most entertaining restaurant in the world. It’s a massive gaudy space in an old strip mall, nestled between a Dollar Tree store and an abandoned Hollywood Video. It’s located about 15 minutes outside of Denver in a town called Lakewood. Gosh, how do I describe it…well, let me say for starters there is a cliff and 30-foot waterfall stage where young shirtless guys do diving tricks into a tiny little pool. Then there’s a medieval damsel in distress. There’s a gun fight. A puppet show. A mariachi band. A pirate. And apparently, a guy in a gorilla costume (we missed this, somehow – dammit!). Entertainment-wise: It’s…weird. Weird. I dunno. Weird. Food-wise: I’d liken it to Taco Tuesdays in prison. It’s really not good, and the meat is a bit suspicious. The Taco Salad is probably the safest, most edible thing to order here. The free, bottomless sopapillas they give you for dessert (fried dough drizzled in honey) are ok. Note: You are required to order a meal when you arrive (about $13); you receive your food cafeteria-style by ladies in hairnets; and you’ll most definitely want a beer or margarita while you’re here. Not because they’re great. Just because you’re gonna want some alcohol. Décor-wise: It’s a sloppy, cheap version of Rainforest Café mixed with random stucco facades. I don’t know if it was poor air circulation or the sensory overload – probably both – but I started to feel super queasy as soon as I stepped into this circus of a restaurant. I felt like I was high on mushrooms (the nauseous, icky part – NOT the fun, hallucinating, everything-is-magical part). I could not finish my food or even my margarita. Sarah and I got up and went for a walk, and thank goodness for that. Walking around and exploring the place was probably the best part of the evening. 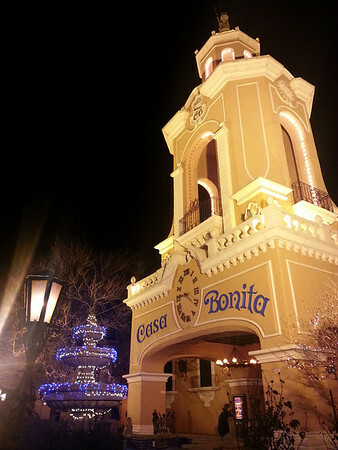 Casa Bonita is a gigantic maze of fun stuff for kids to do. You can get up close and personal with the waterfall from various angles. There’s a cave. A cave dining room. There’s another separate dining room with a magician on stage, complete with audience participation. A caricature artist. An arcade. A themed photo studio. And of course, a gift shop. Would I go back? Absolutely not. But I do have a warm place in my heart for all things weird and wacky. 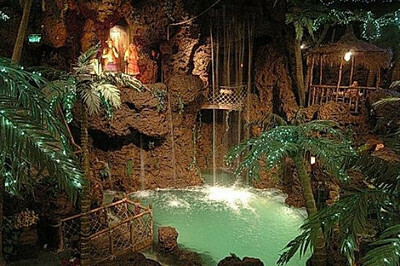 Casa Bonita certainly delivers on the weird, wacky front, and is a once-in-a-lifetime experience. If you have limited time though, and are looking for the best of Denver, do NOT come here! 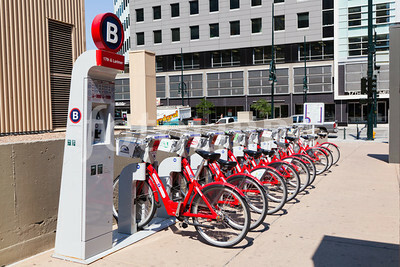 B-Cycle is a bike-rental system. From the many B-Cycle stations throughout the city, you simply stick your credit card in a machine, pay a small fee (we paid $8 for 24 hours), and a bike is unlocked for your use. You then return it to any other B-Cycle station in the city. I’d seen these throughout Europe before, and was so pleased to find em here. 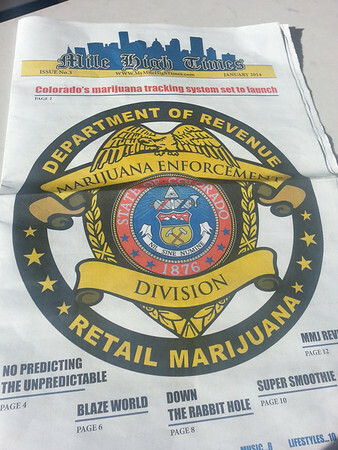 I believe Denver is the first city in the US to offer such a service. Sunday was the perfect day for Sarah and me to rent bikes. The Broncos were playing the Pats to clinch the AFC championship title, and the city was a ghost town! With everybody watching the game, we had the streets of Denver to ourselves – save for some homeless peeps and a few fellow Seahawks fans awaiting the NFC championship game later that day (yay!). We rented our bikes from the B-Cycle rack on 17th and Larimer, and pedaled towards Cherry Creek. The creek runs southeast, alongside and underneath Speer Blvd, and has a paved path for pedestrians and cyclists. You’re pretty much riding side by side with the city, yet you feel far away. It’s a nice little retreat. Sarah and I took our time riding the four miles or so towards the Cherry Creek Shopping Center, then quickly turned around. We’d seen photos of the shopping center in a magazine, and expected a quaint little boutique-y creekside oasis when we arrived. What we found instead were busy six-lane intersections and gigantic shops like Nordstrom and The Container Store. No thanks. We turned around and biked the leisurely four miles back to downtown, just in time to find out the Broncos had won. The streets were alive with orange and blue, as fans came pouring out of the bars and restaurants. ‘Twas a perfect time to return our bikes. You simply place the front wheel of the bike into the rack until the green light flickers three times, and you’re done. Easy peasy. Downtown Denver is very walkable. I’d say start at Union Station – head to Larimer Square – do 16th Street Mall from there – and walk it all the way to the Capitol Building. This was the route Sarah and I ended up on in our wandering, and it turned out to be a perfect walk. 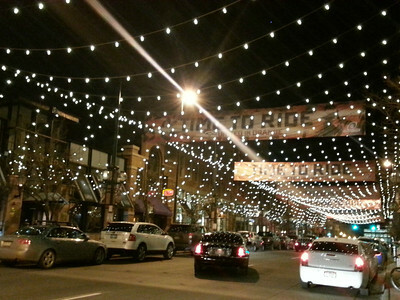 Larimer Square is the one-block stretch of Larimer Street between 14th and 15th Street – Denver’s ritzier boutique and dining area. The block is lined with towncars and limos, and emanates a soft golden glow from the twinkling lights streamed above. 16th Street Mall is like 12 blocks or so of more shops, restaurants, bars and other businesses. It’s probably the liveliest area in downtown, complete with street performers and decent people-watching. It reminds me a bit of Third Street Promenade in Santa Monica. The Capitol Building is apparently where the city reaches 5,280 feet above sea level, coining Denver’s nickname, the “Mile High City.” The elevation doesn’t particularly interest me, but the building is quite beautiful. The entire capitol grounds, in fact, are pretty grand and impressive. Definitely worth a look-see. No trip to Denver is complete without seeing the Rockies. I mean, you’ll definitely see them from the city. They’re stunning! Just miles and miles of gorgeous snow-capped peaks as you drive along the highway. From downtown Denver, it takes about an hour and a half to drive to the national park. Sarah and I are late risers, however, and of COURSE we took our time enjoying a fab brunch first – so by the time we hit the road, it was already late afternoon. Oops. That, and we hit road construction that added another half hour or so to the drive. Double oops. Once we made it to the park entrance after 3pm, we knew we only had about 2 hours before the sun would start setting, so we chalked up the day to a simple “scenic drive.” As we drove through the mountains, we kinda sorta went…mehhhhhh…this isn’t very exciting. We’d heard it’s much more of a sight to behold in the summertime. 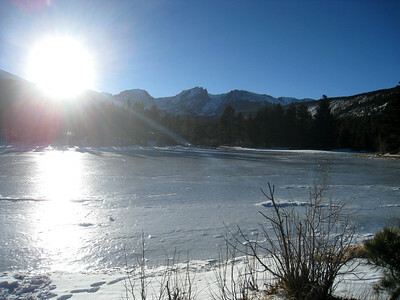 But then we found Sprague Lake. 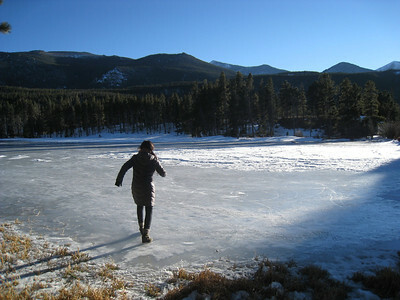 I don’t know if Sprague Lake is anything special to the average visitor, but Sarah and I were beside ourselves with giddiness. Giddy because the lake was frozen. Yeah, frozen. 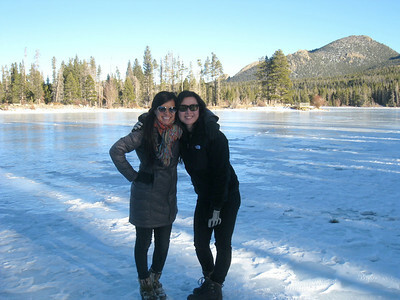 Neither of us had ever seen a frozen body of water before, and we got stupid excited. It excited us. So what. Probably not the smartest thing we’ve ever done, but we just had to try it. It. Was. Scary. Like, reeeeeally scary. We could hear the ice pop and crack around us. And we had no idea how deep the lake was. There was no predicting if or when a chunk of ice would crumble beneath us. But then we saw some dude just straight up walk across the entire thing. Show off. 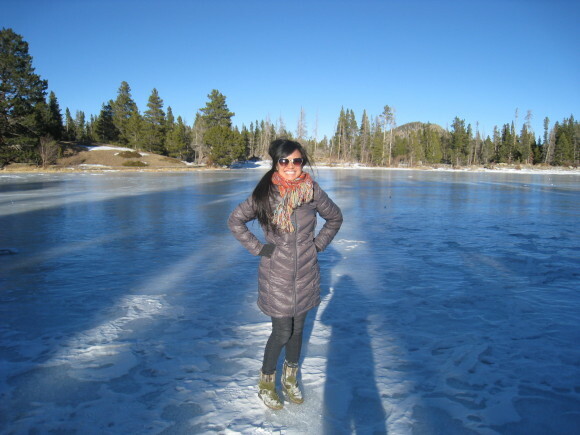 Anyway, slipping and sliding around on this frozen lake and enjoying the serene beauty of it was the highlight of our day in the Rockies! Boulder is a friendly university town about 30 minutes away from Denver. I only had a half day here (alone), and was decidedly going to just eat and hike. Period. I started my day at Brasserie Ten Ten for French onion soup, roasted bone marrow and a pork belly truffle omelette for brunch (sounds better than it actually tasted; it was just ok). 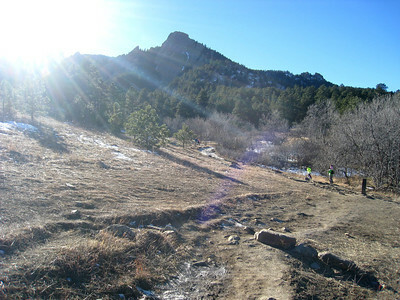 Then I walked it off on my way up to the Flatirons. The Flatirons are a mountainous rock formation often referred to as the symbol of Boulder, and can be seen from just about anywhere in the city. There are several different routes you can take from the car park, some designed especially for rock climbers. But because it’s winter, some of them were closed off. Since I only had about an hour or so, I opted to head up the Chautauqua (shuh-TOK-wuh) route and loop back on the Bluebell Mesa trail. This ended up being about two miles in total and was relatively easy. 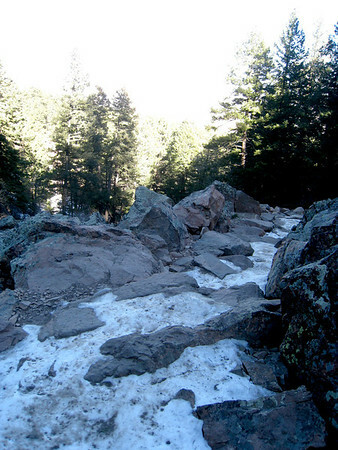 The Chautauqua path was a narrow, rocky, entirely uphill climb that was dry, then muddy, and in some parts, still covered in snow. It was woodsy with little sky visibility, and it got extremely windy once I got up to the Flatirons. This worried me a bit because I was all alone and not wearing the best shoes (admittedly, I had not packed any walking shoes, and did this hike in two-inch wedge heeled boots – don’t judge me, it was unplanned!). But I managed just fine, and my concerns about slipping and falling on the rocks were all for nothing. The loop back on the Bluebell Mesa trail was cake. Wide open spaces, a mild downhill slope and even a few resting areas with benches overlooking the city below. Boulder didn’t particularly blow my mind, but it was quaint and friendly (except at the Ranger’s Cottage at the Flatirons – that lady really didn’t like her job!). I definitely enjoyed my hike there. Then again, I enjoy most hikes. Colorado recently legalized the sale and use of marijuana for recreational purposes, which, personally, does nothing for me. 1) I’m a Washingtonian now and we, too, have legalized recreational weed, and 2) I am not a smoker. Weed is not my drug of choice. The last time I got high off weed was completely by accident. Remember that pool party at the W where someone told me I was a bit on the chunky side? (Haaaa…siiiigh…that was funny). Well, at that same party, my girlfriends had brought a bunch of edibles in various forms. The one that caught my attention was the Chex Mix. I love Chex Mix! I figured having a handful of the stuff would be harmless. BAAAAAAAAD idea. I was stoned out of my mind for like SIX hours, I’m not even kidding. And it wasn’t the giggly/munchies/everything-is-greaaaat kind of high. It was the full-on paranoias-why-is-everyone-mad-at-me-I-think-my-brain-is-melting-out-of-my-skull kind of high. It was miserable and neverending. Anyway! No weed for me. But if I wanted to, I know I could walk into a dispensary and buy up to a quarter ounce (a whole ounce if I had a Colorado ID). To be honest, Sarah and I didn’t see many dispensaries. We saw two when we first drove into town, and not a single one after that. Then again, we weren’t exactly looking. Intensely watching the Hawks beat the 40-Whiners! Ok, so this has nothing to do with Denver, except for the fact that it happened while I was IN Denver. The Seahawks are going to the Superbowl, baby! 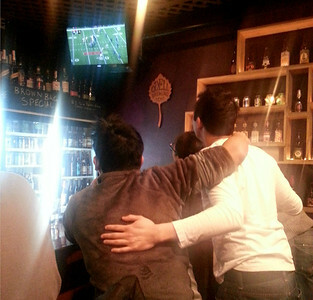 Sarah and I had met up with my friend Anh and his buddies to watch the game at a bar in LoDo (Lower Downtown). Despite the fact that none of them were from Seattle, they were all rooting for the Seahawks, and we were the loudest, most enthusiastic bunch in the bar. What a game! And Sarah and I would spend the rest of the evening obsessing over the Richard Sherman drama and the rhetoric that followed. Suuuuch good stuff. Side note: We were a group of six Asian people, and we may have frightened these Bronco fans and Denverites. Why? Read on. 1) Denver is very white. As in, there are lots of white people. After Sarah and I had settled into Jon’s townhome, we had an odd “Hey-you’re-Asian!” encounter. As you know, I’m no stranger to these (read: Can’t Hide These Chinky Eyes). We had walked the seven blocks or so to restaurant row in the Uptown neighborhood, and on our way back – I’m not kidding – a family of five, driving by in their car, probably around 22nd and Clarkson…slowed down next to us…to HONK and WAVE as if they’d never seen Asian people before. The kids in the back were wide-eyed and beaming. I almost expected them to jump out of their car and ask for a photo with us. It was so bizarre. Ok, so it’s possible it had nothing to do with us being Asian, but Denverites themselves admit that their city majorly lacks diversity. That doesn’t mean they aren’t friendly and tolerant though. In fact, Sarah and I found Denver to be a refreshingly kind city. People were nice. And very white. I really like that Denver is so neat and tidy. There are certainly some dumpy pockets, but for the most part – especially downtown – the streets are free of litter and graffiti. Even on our bike ride on Cherry Creek, which has prime real estate for tagging, I noticed the walls and bridges were virtually spotless. The homeless situation, however, cannot be ignored. There is a notably large homeless population on the streets of Denver, and the city is making efforts to provide more shelters and assistance. 3) Denver is super mellow. If there was any day of the year for Denverites to get loud and rowdy, I’d have thought it’d be when the Broncos won their ticket to this year’s Superbowl. Sure, fans came out onto the streets to cheer and celebrate, and drivers honked their horns every now and then. But this lasted all of about 20 minutes. And the streets fell silent again. Granted, most people had gone back inside to find out who the Broncos would play in the Superbowl (GO HAWKS! ), but even after that, the streets were super quiet. And it was a three-day weekend! Riot police were in wait all evening, and they looked bored out of their minds. Silly, even. The city just isn’t very excitable I guess! Or maybe everyone was just stoned. 4) The air is crisp and refreshing. Sarah and I couldn’t have possibly picked a better weekend in January to visit Denver. The weather was unusually warm – about 67 degrees – and we had nothing but blue, cloudless skies and SUNSHINE the entire time! After the last couple dreary weeks I’d had in Olympia, I reeeeeally needed to see the sun. And Denver was perfect. There’s something beautiful about breathing in cool, fresh air while feeling the warmth of the sun on your face. I’m a big fan. My final thoughts on Denver: I like. 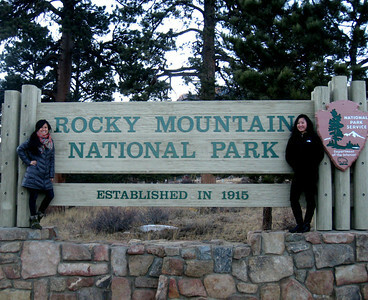 It was the ideal weekend trip – we had great food, met cool people, and spent a lot of time outdoors. We managed to do a lot in those three days, yet never felt rushed or pressed for time. We didn’t get to go snowshoeing as we’d hoped (not enough snow), but we were certainly pleased with everything that we did get to do. Despite all the traveling I’ve done in my life, very little of it has been within the States. I have gotten my kicks on Route 66; been to Vegas more times than I can count; gone camping a ton throughout the Pacific NW; and now I’ve experienced a bit of Denver and the Rocky Mountains. I plan to take more weekend trips like this to explore Amurrica and eventually work my way east. There are so many national parks I wanna see (I still have to tell you about last year’s camping trip to Zion – it was AWESOME! ), and I’ve got my sights set on Chicago, Austin and New Orleans. See! Who says you can’t have a “normal” life and still get to experience the world? Just because I have a humdrum office job now, doesn’t mean I’m gonna stop living. Weekend warriors unite! Lemme know the next time you’re going to be in Socal. I’ve got a bunch of camping trips planned for this summer.